After Benson takes roll, we will go to the library where students will take the "My Voice" survey. We will return to the classroom to go over the "Recipe for a Cloud" lab. Attention honors students - MESPOWs for this week are #43 and #62. We will go over a recent worksheet ("Vapor, Clouds, and Precip.) and then watch a 30-minute video. If you miss this class watch the first 28:45 of this video, and then check out the resources below. Students will take notes as Benson explains concepts related to atmospheric pressure (demo included) and then students will do a worksheet. If you miss this class watch this Can Crush Demo (YouTube video). After a quick review of recent topics, Benson will do a demonstration and then students will do a "can-crush" activity. If you miss this class, watch this Fountain Demo (YouTube video) and check out the other links listed below for November 5th. Students will do a lab ("Convection"). If you were gone, print the lab handout (Convection Lab) from this site, watch the videos of Part A of the Convection Lab and Part B of the Convection Lab, and do the questions on the lab handout. November 5: Can Crush Demo on a MUCH Larger Scale! October 26-30 is Cloud Week! Students in periods 1, 3, 4 will do a worksheet. Students in periods 6, 7 will take notes on a handout. If you were gone, carefully this web page. October 19-23: Test on Wednesday! We will go over a recent graph activity and then take notes (NE) as Benson explains temperature inversions. Students who miss this day should go to this website and read it carefully. They should also, go back to Benson's website and watch the PowerPoint titled "Notebook Entry: Inversions". Attention honors students: MESPOWs this week are #14 and #104. We will review for the test. Students will be given a review sheet, which is posted here. Students will do a lab today - Introduction to Humidity. If you miss this lab, do "Reviewing Concepts" 1-6 on page 509. Honors students should do "Concept Check" questions on pages 492 and 498 if they miss the lab. Students will take notes on a handout as Benson explains "humidity topics". If you were gone, get the handout from Benson and then copy the notes from a classmate. Also, be sure to watch this video: Relative Humidity at Football Practice and the video below. October 12-14 . . . No school Thursday and Friday! Classes are a bit shorter today due to early release (every Monday). We will go over the recent graph activity, and then students will learn about "acid rain" (notebook entry). If you are gone, go to this web page, find the "Acid Rain PowerPoint", watch it, copy the notes, and watch the video below. Benson will be gone today. Students will do a worksheet (WS: Temperature). If you are gone, go to this web page, print out a copy, and do it. Question(s) of the week: What is meant by the term, "annual temperature range"? Why is Bismarck (North Dakota) colder than Seattle in the winter AND hotter than Seattle in the summer? Classes are a bit shorter today due to early release (every Monday). We will review the global warming issue and then start watching the video called "Chasing Ice". If you were gone be sure to watch this video and the video of the week (below). Honors students: MESPOWs for this week are #59 and #94. Students will continue watching the video called "Chasing Ice". 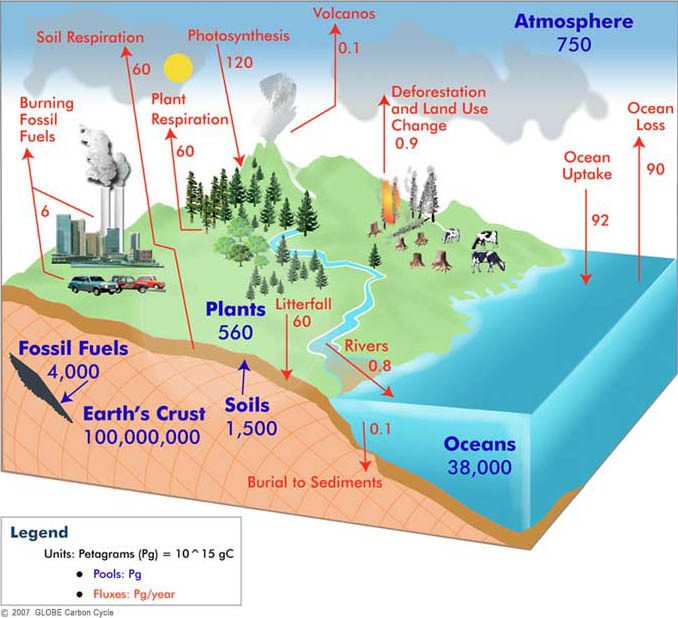 Students will do a graph activity called "Climate Data from the Past". If you were gone, get a copy of the handout from Benson, take a look at the PowerPoint posted on this page, complete the activity, and hand it in. Also, watch this short video. Students take a short notebook entry and then finish watching "Chasing Ice". If you were gone view the the PowerPoint posted on this page, and then go to the EIS website and watch both short videos. We will have a notebook entry and then Benson will explain the UV Bead Project. Watch the video below. After Benson explains the project, students will have time to start planning their projects. Here is a description of the project-> UV Bead Project. Honors students: Only one MESPOW for this week (#18). Benson will review the UV bead project, and then students will be given these 3 period to work on the project. Projects are due at the start of class on Friday. Students will take notes on a handout as Benson explains concepts related to the global warming issue. If you were gone, get a copy of the notes handout, copy the notes from a classmate, and watch this short video. Also, take a look at this interactive graph and watch this video. Finally, watch this video. Question(s) of the week: The vast majority of climate scientists believe that the current climate change is caused (in part) by humans. Not everyone agrees with the scientists. According to scientists, what are we doing to cause the world to get warmer? Explain how they think is causing our atmosphere to trap heat. Reminder: Students can come in this week (Tuesday-Friday) on their own time (before school, lunch, after school) to make corrections on their tests. Honors students can only do this if they scored below 70/100 - and they can only raise the score to 70/100. Classes are a bit shorter today due to early release (every Monday). Benson will be gone today, so students will do a worksheet. Honors students: MESPOWs for this week are #1 and #29. Read them both carefully and choose one to do with the WS. Students will do an introductory lab activity related to the composition of the atmosphere. Students will listen and take notes as Benson explains "The Hole in the Ozone Layer". To download/view the presentation, go to Benson's teacher page and select the link titled, "Click Here to Download PowerPoints". If you were gone, get a copy of the notes handout and fill in the notes as you view the presentation. Also read this web page, and watch the video of the week below. Benson will show students a demonstration, and then students will continue to take notes and learn about the hole in the ozone layer. If you were gone, copy the notes from a classmate and read this web page. Be sure to select the arrow to watch the change over several years. Also, read this page and watch the video below. Students will do an introductory lab activity to help them understand experimental design. September 14-18 - First Test on Friday! Classes are a bit shorter today due to early release (every Monday). Benson will explain the phenomenon known as "El Nino" and then students will work start a map activity related to El Nino. Attention honors students - The MESPOWs for this week are #8 and #49. Carefully read both of them and then decide which one you want to the the worksheet with. The MESPOWs are due SOC on Friday. Students will watch a video called "The Open Ocean". We wrap things up and review for the test tomorrow. Students will be given a review sheet. Reminders: Open house for parents starts at 6 pm Thursday night, and the first Outdoors Club meeting will be during lunch in Benson's room on Friday (see link to Facebook page in sidebar). Benson will return the labs from last week and go over them. Students will also take notes as Benson explains "salinity". If you miss this class read this web page, copy the notes from a classmate, and watch the video below. We will be doing a lab today. The WS that goes with the lab is due SOC Thursday. If you miss the lab, get a copy of the lab handout from Benson, watch this Briny Deep Lab Video, and complete the handout (you will need your book). Students who have a low score on an assignment can do a "replacement assignment". To print a copy go back to this page, select "click here to print handouts", print it out, and hand it in by the start of class on Monday 9-14. The score that you get on this assignment will replace your lowest (non-test) score so far. Students will take notes as Benson explains "The Ocean Conveyor Belt". If you were gone read this web page. Then we will will watch a video about El Nino (a topic to be covered in more detail next week). If you were gone, copy the notebook entry from a classmate, and click here to watch a short video. Students will watch a video about the K-T boundary. If you were gone, carefully read this web page and watch the video here. Honors students - MESPOWs are #26 and #87. Students will watch a video. If you are gone, print out the WS here and watch the video called How the Earth Was Made: The Alps. We will review several concepts and then do some maintenance on our crystals that are growing in the jars. Here's the explanation about the dress. Friday: Sea Creatures in Glacier Park? Students will do a lab. During the lab they will determine the density of 3 different kinds of igneous rocks. Honors assignment: There is no MESPOW this week, but read through The Crown Butte Virtual Field Trip - Look at all of the photos/diagrams and read all of the explanations. We will return and go over several recent assignments/labs, and review for the test. A review sheet will be provided. Students will take a test and then do a WS. Students will take take notes as Benson explains several aspects of mineral formation, including crystals. IMPORTANT: Print out the Crown Butte Virtual Field Trip and hand it in by the end of the week. Your score on this assignment will replace your lowest score so far this quarter. Honors students - The MESPOW is #115. Students will take notes as Benson explains "plutonic formations". If you were gone, read through the Crown Butte Virtual Field Trip and read/watch all the resources posted in the links below. Read pages 295-297. Students will watch a video about the geology of Yosemite Park. If you are gone, print the handout here and then watch the video here. Honors students will take notes today and then watch the video on Friday. Students will take notes as Benson explains various types of igneous rocks. Read 70-74. Honors students will do the lab today (see Friday links below - If you are gone, print the lab and follow instructions). Students will do a lab titled, "Igneous Rocks". If you were gone, see the links below for Friday - Print out the lab handout and follow directions. Honors students will watch the video today (see Wednesday). Honors students: Print the handout here and then watch the video here. Students will take continue taking notes as Benson explains various hazards associated with volcanism. See links below if you were gone. Benson will explain 3 great eruptions and we will finish the notes on volcanic hazards. Then students will set up a crystal growth lab. See links below if you were gone. Students will watch a video called Earth's Deadliest Eruption. See links below for make-up assignment. Students will do a lab to called "Magma and Lava"
January 26-30: The new semester begins. Students will take notes (on handout) as Benson explains basic concepts related to volcanism. Attention honors students: MESPOWs this week are #6 and #80. We will review the different types of volcanic activity and then students will be given time to start the assignment (WS: Intro to Volcanism). Attention honors students: Benson will also explain the "science circus project" to you. A handout for the project is available HERE. Students will do a lab - "What happened at Lake Nyos?" We will watch a video - "Mystery of the Meagavolcano". If you were gone, be sure to watch it HERE. Benson will explain various hazards associated with volcanoes as students take notes. Question(s) of the week: What are the three basic types of volcanic activity? Provide an example of each. IMPORTANT: The review sheet for the semester test (and other handouts) can be found HERE. Students will do a group problem-solving activity realted to the movement of tectonic plates. Benson will tell students about the test, provide a review sheet, and then give students time to organize their notebooks. During the two weeks before finals week (January 20-23) students will be learning about the basic structure of the Earth and plate tectonics. Today they will start watching a video titled "Magnetic Storm" (to be finished tomorrow). If a you miss this day, get online and watch the 55-minute video HERE. Attention honors students: The MESPOWs this week are #20 and #118. Students will watch a video titled, "Birth of the Earth". Click here to watch the video. Benson will explain the structure of the Earth and paleomagnetism, and then students will do a WS titled, "Plate Tectonics". Jan. 6: Science and/or Religion?